Interested in a better 401(k)? We've built the first conversational artificial intelligence that can talk to your employees about their retirement goals and challenges. Our AI is available 24/7 in all of our retirement plans. It acts as an “Emotional Advisor” to help employees work through their excuses for putting off saving for retirement. 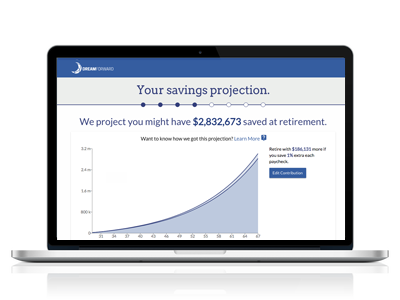 Our new technology is reinventing the 401(k). Behind the scenes, our compliance and investment partners have decades of experience. Our Emotional Advisor AI technology addresses employees’ real-life concerns and helps keep them on track. No hidden fees. No conflict of interest. Lower costs for businesses and employees. Our fees go down as your plan grows. Perfect. Want more information about how to get an affordable 401(k) that can help employees with their real-life concerns? Investments are not FDIC Insured. No Bank Guarantee. May Lose Value. Investing involves risk, including the risk of losing principal. Past performance is not necessarily indicative of future results. Asset allocation and diversification does not necessarily eliminate the risk of experiencing investment loss. Dream Forward Solutions, Inc. and its partners don’t warrant or guarantee its process will lead to success. You should make every effort to understand the risks, fees, and potential implications involved. ©2016-2018 Dream Forward Solutions, Inc. All rights reserved.